Greetings. 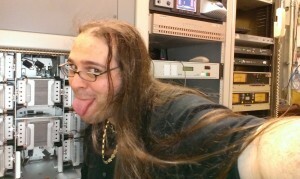 I’m Tom Morris, KG4CYX, Certified Broadcast Technologist, broadcast engineer, ham radio operator, and colossal nerd. I post silly things here. I’m available for consultation on various matters of radio, broadcasting, and electronics – drop me a line if you’ve got a project going. When I’m not on the airwaves – find me on Instagram, Twitter, Facebook, or Ello. Hi, I found your website through a Google Image search for SunSaver MPPT. I really like your pics of dead equipment and commentary. Keep it up. The solar power industry can be weird with fanboys of specific brands etc. I’m a realist and know STUFF BREAKS. Though some stuff breaks less than other stuff. Speaking of that, do you know anything about Flexcharge charge controllers? They are a small company from Michigan. The owner emailed me with info I requested about his units. I’d like you to take a look if you could. In return I have a ton of cool project info to share. You might dig some of it. Email me directly and I’ll get the text to you. Got inside pics of a Steca/Instapark MPPT 2010 20A charge controller. Mail me back and I’ll send em!